Helping You Protect What Is Most Important. When difficult family law issues arise, it can disrupt every aspect of your life. What once was a source of stability and comfort becomes stressful and worrisome. My name is Donald E. Robinowitz and I am the leading attorney of The Robinowitz Law Firm, P.C. Since 1990, I have helped individuals and families in the Houston, Texas, area, including those in Harris County, Galveston County, Montgomery County, Brazoria County and Fort Bend County get the help they need in difficult legal matters. Over the years, I have garnered a reputation for success. I work hard to ease the legal burden for my clients, extended a high degree of understanding, compassion and a drive for results in divorce, child custody, child support, property division, spousal maintenance, paternity and other family law issues. 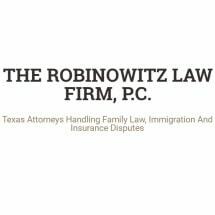 Beyond this complex area of law, my firm is a team which includes myself, an Associate lawyer and three paralegals, also represents clients in immigration matters (i.e., visas, green cards, citizenship, and removals), personal injury, as well as in residential and commercial insurance claims. I firmly believe that individualized attention to legal matters can make a difference in a person's life for years to come, which is why I work closely with every individual I represent. I welcome you to contact my office any time. We answer phones on evenings and weekends, and offer flexible appointments outside of office hours as necessary. Call 713-893-1886 or toll free at 888-587-9098 for a free initial phone consultation today. My office accepts credit card payment and offers Spanish language services as necessary.